Teresa Ruch Dyeing the New Fibers Nov. 9 & 10, 2013, 10 am – 4 pm. Indie dyer Teresa Ruch will be teaching a two day workshop on Dyeing the New Fibers on Saturday Nov. 9 and Sunday Nov. 9 from 10 am to 4 pm. 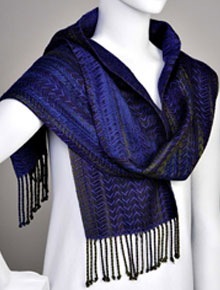 She will have you dyeing bamboo and tencel yarns with acid dyes in nothing flat. We will be focusing on color interplay and dyeing to get the maximum results with color. We will also be playing with a pseudo ikat and feather shift patterns. Both days of the workshop will be held at the Redwood City Veteran’s Senior Center at 1455 Madison Ave. in Redwood City. Signups are being taken and a deposit of $100 is requested. Final cost will be determined by the number of participants. This entry was posted in Past Workshops, Workshops and tagged dyeing. Bookmark the permalink. Both comments and trackbacks are currently closed.